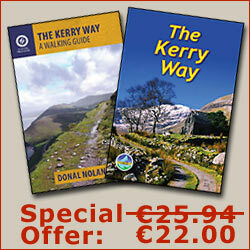 The Kerry Way leaves the popular tourist town of Killarney at the start of the Muckross Road. The trail heads south, passing numerous bed and breakfasts and hotels as it leaves the town. After completing the first kilometer, the trail crosses the River Flesk, whereupon the density of the housing starts to dissipate. A gravel path set back from the main road is then shared with by horse-drawn jaunting cars for the next 1½km. Due care must be taken when walking this section with the additional traffic. After passing the last of the hotel entrances to the right, the Kerry Way turns off from the road and into the Bourn Vincent Memorial Park. 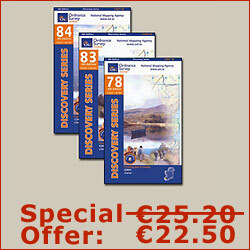 The next 1½km of trail skirts the edge of Casltelough Bay with great views across Lough Leane to the Shehy Mountains. Walking beneath the canopy of deciduous trees, the small rocky islands of Osprey Rock and Friar's Island can be glanced through gaps in leafy branches. Joining back up with the tarmac path, the Kerry Way approaches the popular tourist stop-off point of Muckross House. The splendid 19th century victorian house and gardens are open all year round to the public. There is an admission fee at the door. Leaving Muckross House the trail continues on past fields of grazing cattle. Muckross Lake lies to the west and the looming Torc Mountain straight ahead. The pleasant stroll gradually passes through a copse of trees and once again reaches the N71, Ring of Kerry Road whereupon it passes through a tunnel beneath the road. 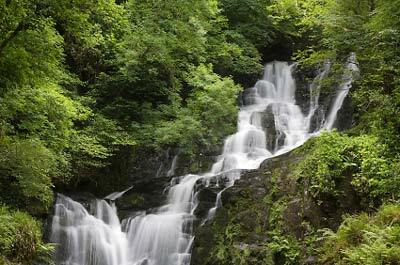 There is a small car park here with a short walk leading up to the foot of Torc Waterfall.